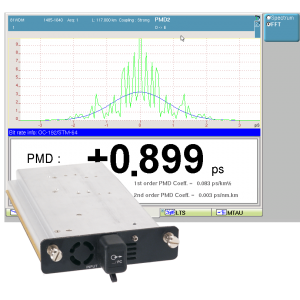 Fast, cost-effective and accurate polarization mode dispersion (PMD) testing for high speed networks characterization. PMD is one of the most critical parameters to consider when characterizing the fiber’s suitability for carrying high-data-rate transmission. While PMD limitations for 10 Gbps (Ethernet or [SONET/SDH]) do not present major obstacles for transmission deployments, potential issues with the further reduced limits associated with 40G and 100G require clear and correct consideration. The VIAVI PMD test solution provides fast, reliable and field-designed solution to help you characterize your fiber optic network with efficiency.